Noel & Russell – Not That One! Noel Fielding will be a special guest on the first episode of Staying In with Greg and Russell, the new 8-part BBC3 chat show. 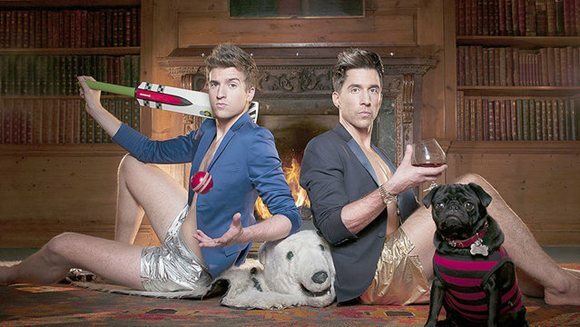 Hosted by Radio 1’s Greg James and comedian Russell Kane, the show is set in the boys’ flat and each week they invite some celebrity guests along, and pull out all the stops to make Staying In a night to remember. Joining Noel and the boys are Rizzle Kicks and Jason Derulo. The first half-hour episode of Staying In with Greg and Russell is on BBC3 on Wednesday 25th September at 10pm and is repeated on Thursday. But that’s not all, there is a special XL version on Friday 27th from 9.45pm to 10.30pm. This will also be repeated at 12.55am. Both versions will be available on iPlayer. Pop over to the BBC3 website to find out more.